Orthodox mission team member with His Beatitude Archbishop Anastasios and Albanian women who participated in this years conference for clergy wives. Seven women from various Orthodox Christian jurisdictions in the United States of America have come to Albania to help lead two conferences for the Clergy Wives of the Orthodox Church in Albania. This effort is the vision of His Beatitude, Archbishop of Tirana, Durres and All Albania, Anastasios. OCMC Missionary, Diakonissa Alexandria Ritsi welcomed fellow clergy wives from America: Renee Ritsi, Stephanie Panagos, Joy Corona, Anna Lillios and Maggie Hock and lay leaders Stella Wacker and Marina Cordemus. 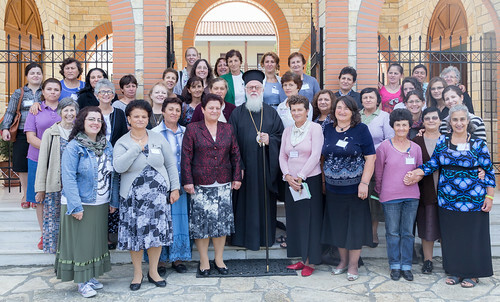 After two days of orientation and visits to the new Cathedral and facilities of the Orthodox Church, the eight women traveled to the Resurrection of Christ Theological Academy in Shen Vlash where they will conduct two three-day conferences for their fellow Orthodox sisters from the Metropolises of Tirana, Berat, Korça and Gjirokaster. Nearly 100 women are expected to attend the conferences being held this week at the Saint Vlasios Monastery and neighboring Myrrh Bearing Women Skiti. The theme of the conference is “Mary and Martha: being servants and students of Christ.” The presentations will be focused on the role of being a faithful student of the Church and a servant to Jesus Christ. The women will participate in large and small group presentations, Bible studies, crafts and liturgical services. It has been almost ten years since the last Clergy Wives Conference. It is a time of fellowship, prayer and growing closer to Christ. The Team leader is OCMC Mission Teams Associate Director Presvytera Renee Ritsi. She has organized this effort under the guidance of His Beatitude Archbishop Anastasios. He knows the need for support for the Orthodox women here in Albania and is delighted for his flock to have this opportunity to expand their spiritual awareness.